If you watched TV in the late 90’s to early 2000’s, you probably caught a glimpse of Youree Dell Harris, better known to many as Miss Cleo. With her elaborate printed dresses and chunky jewelry, Miss Cleo was a sight to behold as she plugged the services of the Psychic Readers’ Network hotline. 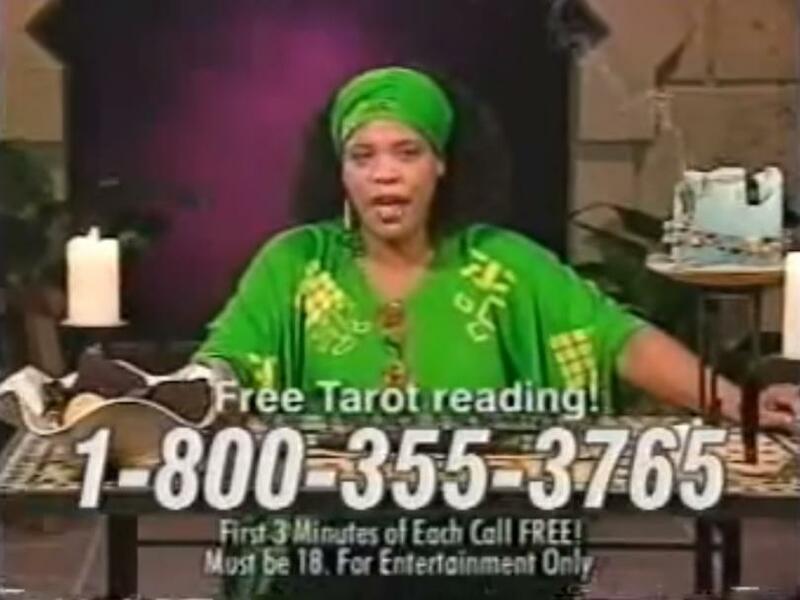 After a series of lawsuits in 2002 required the hotline to clear up some “confusion” about their marketing and prices, it came out that Harris was an actress and unsurprisingly, Miss Cleo and much of her background were an invention. Youree Dell Harris was born into a Jamaican family, though she’d never been to Jamaica herself and the accent she used in character was played up. Her conservative family highly valued education and they sent her to an all-girls Catholic boarding school. After graduating from the school she got married at 19 to a man and had a daughter with him. The marriage ended when Harris was 21 and she eventually moved to Seattle to pursue theater. Having produced and performed in 2 other plays at the Langston Hughes Cultural Arts Center, she eventually wrote a play called “For Women Only” in which a character named Cleo with a Jamaican accent made her first appearance. Apparently this was also when Harris began having some transparency problems. She told her cast-mates that she had sickle cell anemia and that she’d studied theater arts at University of Southern California. Neither of these things was true. Given a certain budget for her plays, she spent it on unrelated expenses and also neglected to pay the cast and crew. She left town suddenly and with a string of broken relationships. To clear things up before she left though, she told people that she had bone cancer and that was why she could not afford to pay them. This is when Harris landed the role of Miss Cleo and became the face of the Psychic Readers’ Network. With a backstory about having been trained in voodoo by a Haitian mambo she implored people to call in for a free reading. When people called, they were frequently redirected to phone banks consisting of a slew of other actors who’d also been hired and given scripts to base their readings on. Eventually the Psychic Readers’ Network began to draw lawsuits for its misleading pricing structure and misrepresentation of its employees supposed supernatural abilities. Harris unfortunately garnered a reputation as the master con artist, even though she was essentially just an actress hired to play a character. Over a two-year period, the hotline made more than one billion dollars, while she made a comparatively small $450,000, from her on-air work and from doing readings herself. When the company shut down, Harris capitalized on her reputation, continuing to do readings for a few years and describing herself a “voodoo priestess.” She also made appearances on TV, performed weddings, blessings and house cleansings, and hosted a podcast. Though she passed away from cancer in 2016 at just 53, the mark she left was indelible.